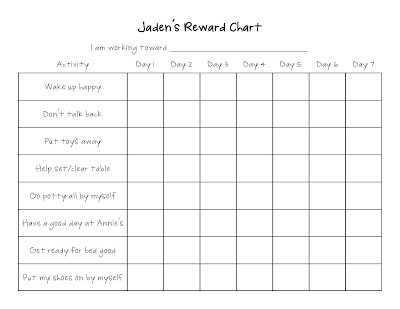 I'm happy to say that the reward chart is working wonders for Jaden! She is on her third chart and looks forward to putting stickers on each evening. I'm going to explain how we work the chart in a little more detail. I've had a few emails from readers wanting updates! We just filled these in as she got them (only allowing for one sticker per activity per day). If she missed one one day but got it the next day, we didn't skip a square, just filled in the missed one. The chart concept was new to her when we started this. By giving her only six tasks to focus on, we weren't constantly butting heads with her on what she was supposed to be doing. It introduced her to responsibility. She really wanted her Jessie doll and I think it seemed too far out of reach with so many squares to fill. I think that when she finally got it, she realized that good behavior leads to good rewards. I felt like she would go an entire day, completing each activity, yet was not rewarded. With the second chart, we introduced the prize bag. Basically, I filled a gift bag with little trinkets I found around the house (a fancy watch that didn't work anymore, a Hawaiian lei, some stickers, necklaces, sea shells, etc.). If Jaden completed every activity in a single day, before bed she would get to pick from the prize bag. She loved this and really tried harder to make sure she was getting everything done. If she missed a task, we skipped that square and started on a new column the next day. At the end, she had to complete the missing squares before she could get her big prize (a new book). We added a couple more activities that are more learning than behavior oriented. Jaden is doing GREAT with her charts! She likes having new things to work on. In fact, she often tells us something that we should put on her next chart. We still use the prize bag with this chart and currently she is working toward a Rapunzel doll from the bookstore. Some readers were concerned that we were trying to control her feelings. That is not the case at all. Yesterday, Jaden had a hard time getting out of bed. She was really tired and was just kind of being... well, a three-year-old! I had laid her shoes out for her to put on and when I went to check on her, I saw the shoes still on the floor. I asked her again to put her shoes on and noticed that she was working on putting a different pair on. I praised her and told her she was doing a great job! She threw a fit and insisted that I didn't like her brown shoes because I set her white ones out, threw her shoes down and refused to even try to put them on. Instead of focusing on her tantrum, I just explained to her that she would need to work on waking up happy and putting her shoes on by herself tomorrow (she did both this morning with no fuss) if she wanted a sticker. She didn't get to pick from the prize bag last night and understood why. 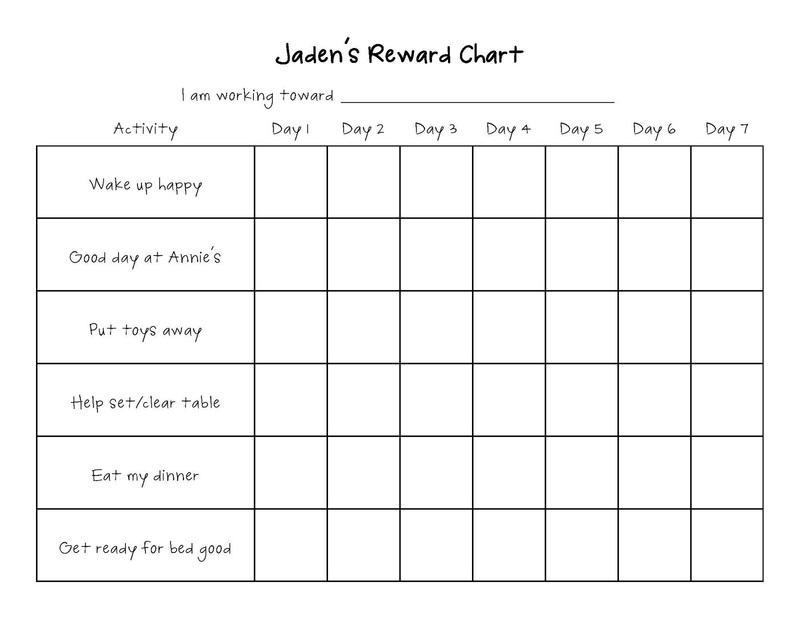 Reward charts might not work for every kid. 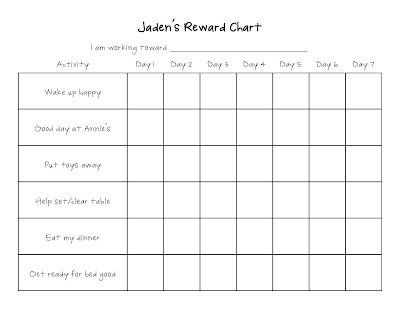 Jaden is the type of kid that likes to have a routine so it works great for her. Also, she's old enough to know when she is doing something she is not supposed to. She is also old enough to help out with little things like setting and clearing the table. I don't think I could have introduced the chart to her at a younger age. She wouldn't have been able to understand the concept. I've created a blank chart available for purchase in my Etsy store! Are you using a reward system? What have you found works or doesn't work? How old were your kids when you started? Make sure to add one or two easy ones for her so she can at least accomplish one or two each day. Saying please and thank you would be good ones for that age too. You have a lot of really great things implemented! 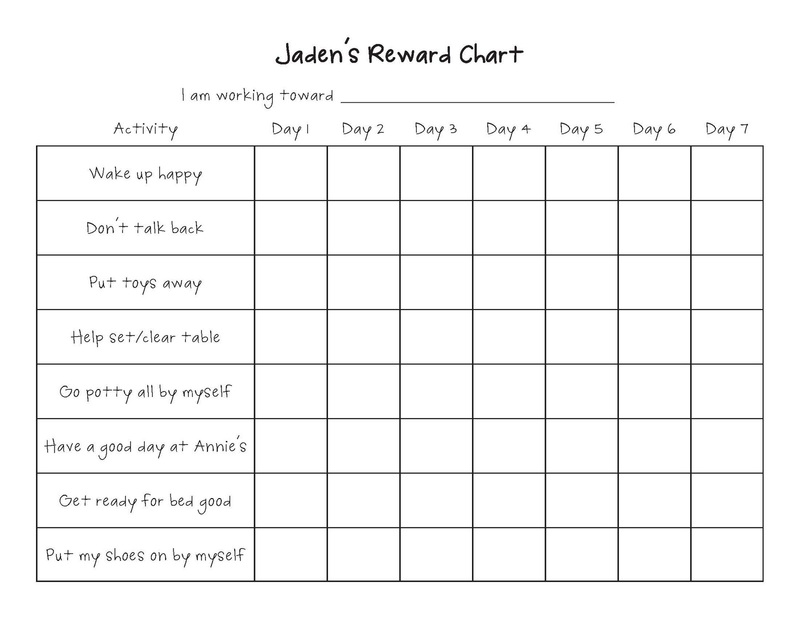 What I can say in short about behavior charts is that 1)they need to be something your child can accomplish. If it is too far out of reach, your child will just have the message that s/he is a failure and "it's too hard anyway so why try". Over time, you can revise the chart to replace accomplished goals with things that increase in challenge. 2)the rewards need to be immediate enough that the child feels motivated. Remember that kids don't have a true concept of time. Don't let a full day go by before a reward can be earned. Some younger kids will need to earn interim rewards like stickers or playdoh time (see #3) in less than a day to keep motivated. 3)your child has to buy in to the reward. choose something you know the child doesn't often get to do. I often recommend that parents not choose a monetary or purchased gift to get away from the 'money buys happiness' message and choose an activity that the child enjoys but doesn't often get--ideally something that involves the parent. 4)the chart needs to be as black and white as possible. If the goal is too abstract, like, "Be good", the child won't know exactly what to do to achieve that goal. Switching "Be good" to a more specific "Keep your hands to yourself and speak kindly with others" will be a much more concrete goal and won't allow you to feel conflicted as to whether or not the child was "good enough" to merit a star 5) be consistent! This one thing could make or break the success of your reward system. If you say, "Well, you didn't pick up your room like the chart says, but you did have such a nice attitude that you get the reward anyway", well, you've just shown that your reward system isn't really worth anything. Also, if what you are doing is working for J, keep it, but in general I wouldn't recommend starting with more than 3 goals for any given child (even a 10 year old) for more effective long-term results. For kids who show that they can't be successful with three goals, narrow it down to one and as soon as they have accomplished that for a solid week, try to up it to two, then three. I'm so glad you are working on positive reinforcement! It's the key to raising loving, giving kids with positive attitudes about themselves!